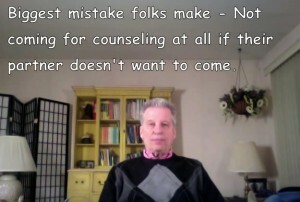 Dr. Marty talks about How One Person Can Save A Relationship. When your partner isn’t willing to come in for help with the relationship, it is even more important for us to talk. By waiting for them to be ready, you are putting the future of the relationship in their hands. If you really want the best chance to save your relationship, you need to learn what you can do. If your relationship is in trouble, don’t wait for your partner to be ready. While you’re waiting for them to come for couples counseling, things will get worse, and rebuilding your relationship gets harder. As you learn to deal more effectively when your partner won’t join in counseling there are two things that often happen. First, many partners notice the change and they respond favorably. They also become more willing to communicate. Second, the other person becomes less defensive, because they see that counseling is actually making a positive difference and very often they are willing to come in for counseling.